Biography*: He married, firstly, Beatrice (?). He married, secondly, Alice Hay, daughter of Sir William Hay of Lochorwart and Yester and Alice de la Haye, on 7 August 1421, although this marriage may not have occured at all. He died between 1455 and 1457. He succeeded to the title of 4th Earl of March [S., c. 1290] circa 1420. He succeeded to the title of 10th Earl of Dunbar [S., c. 1115] circa 1420. He was invested as a Knight in 1424. He was simultaneously fobbed off with the cosmetic title, Earl of Buchan (never assumed by George and conferred to another person altogether a few years after). In 1434 he was deprived of the Earldom by King James I on the pretext that the allegiance renewed by 9th Earl after 1406 had been invalid since it was negotiated with a Regent rather than King regnant, hence that the Earldom and estates remained forfeited because of the 9th Earl's treason. The true reason was King James's desire to end the power of the only intermittently loyal Earls of Dunbar once and for all. As a result he took flight to England, where he was paid a paltry sum from Scottish sources till his death. George de Dunbar, 10th Earl of Dunbar and March (1338–1420), 12th Lord of Annandale and Lord of the Isle of Man, was "one of the most powerful nobles in Scotland of his time, and the rival of the Douglases." Pitscottie states that this George is a son of John de Dunbar of Derchester & Birkynside, by his spouse Geiles (or Isabella), daughter of Thomas Randolph, 1st Earl of Moray (d. 1332). John was son of an Alexander de Dunbar, Knt. Alexander was a younger brother of Sir Patrick de Dunbar, 9th Earl of March. George succeeded his cousin or uncle Sir Patrick in his honours and estates, and appears in a charter dated 28 June 1363; and is second witness, styled 'cousin' of Sir Patrick and his wife 'black' Agnes, in another charter signed at Dunbar Castle on 24 May 1367. "Robetus de Lawedre, consanguineus noster" (a cousin) witnessed a charter of "Georgii comitis Marchie" relating to Sorrowlessfield, a still extant property on the (A68) road south of Earlston, Berwickshire, in the reign (1390–1406) of Robert III, indicating both his extended family and that he was active in the management of the Dunbar family estates during Robert's reign. The Earl of March accompanied James Douglas, 2nd Earl of Douglas in his incursion into England, and after the Battle of Otterburn (1388) he took command of the Scots, whom he conducted safely home. His daughter Elizabeth was betrothed by contract to David Stewart, Duke of Rothesay, son of King Robert III and heir to the throne, but Archibald Douglas, 3rd Earl of Douglas, 'The Grim', protested against the match, and through the influence of the Duke of Albany had the contract annulled, and the prince as married to his own daughter Marjory, instead. In consequence of this slight upon his family's honour, George renounced his allegiance to Robert III and retired into England, placing himself under the protection of King Henry IV. On 28 June 1401, Henry granted, by Letters Patent, to "George de Dunbarre earl of the March of Scotland and Cristiana his wife" the lordship of Somerton in Lincolnshire, and the heirs male of their bodies, to be held by homage and military service. On the same day Henry gave "George de Dunbarre earl of the March of Scotland" £100 sterling per annum "of his special favour" and in October granted him 'costs' of £25/9s/7d; and granted his wife "Cristiana countess of Dunbarre" £40/19s/3d "for her charges and expenses coming from the North at his command, to prosecute certain matters touching her husband, herself, and their heirs". In 1401 he made a wasteful inroad into Scotland, and in June 1402 he was victorious against a small Scottish force at the Battle of Nesbit Moor. At the subsequent Battle of Homildon Hill he again fought on the English side. In the summer of 1403 the Percies declared open revolt again King Henry IV and raised their Standard of revolt at Chester. A plan was hatched to seize the King's son, the young Prince of Wales, at Shrewsbury. The plan was foiled by the extreme speed with which Henry IV moved once he heard details of the revolt. "Egged on by his very competent and energetic ally, the renegade Scotsman, George Dunbar", he drove his men across the Midlands towards Shrewsbury, raising more troops as he went. The Battle of Shrewsbury took place on 21 July 1403, with Dunbar fighting on the side of Henry IV. It was a Royal victory and the revolt was, for the moment, over. Thereafter in the same year "George de Dunbar earl of the March of Scotland" petitioned (Parliamentary Petitions, No.961) Henry IV stating that he had lost all his castles, lordships, goods and chattels in Scotland on account of his being his liegeman, and asked the King to "ordain in this parliament that if any conquest is made in the realm of Scotland, the petitioner may have restoration of his castles, &c., and also his special protection for all dwelling in the earldom of March who come to his allegiance hereafter". This was endorsed by the King. On 21 January 1403/4 "George de Dunbarre earl of the March of Scotland" received a £100 annuity from Henry IV. Between 14 and 18 August 1403, King Henry granted George de Dunbar, Earl of March, the ward of the manors and lordships of Kyme and Croftes in Lincolnshire, and a house and chattels in Bishopsgate, City of London, for life, which had previously belonged to the late Thomas Percy, Earl of Worcester, and was forfeited by his rebellion. Under a Letters Patent, "the King's cousin, George de Dunbarre, Earl of March of Scotland", for "his daily service and great costs" was given the manor of Clippeston in Shirewood by King Henry IV on 10 June 1405. In addition, on 14th of the following month, the King gave him the ward of the lands of the late Thomas Umfraville in Haysille on Humber in York, till the majority of Gilber his heir, or his heirs in succession if he dies in minority. In addition he shared in the forfeited estates of the attainted Thomas Bardolf, 5th Lord Bardolf (who later fell with Percy at the Battle of Bramham Moor in February 1408). However, as the following decree shows, George did not retain them all: "27 April 1407. The King to the sheriff of Lincoln. Referring to the late plea in Chancery between Amicia wife of Thomas, late lord of Bardolf, and George de Dunbarre regarding certain lands in Ruskynton forfeited by Thomas, which had been granted by the King to George, with the manor of Calthorpe, the half of Ancaster (and many others), wherein it was adjudged that Rusynton should be excepted from the grant and restored to her with the rents, etc., from 27 November 1405, drawn by George, - the King orders him to restore the same to Amicia. Westminster. [Close, 9 Henry IV. m.17.]". Through the mediation of Sir Walter Haliburton of Dirleton, reconciliation with the Douglases was effected in 1408, and he was allowed to return to Scotland the following year, taking possession of his earldom of March, but said to be deprived of the lordship of Annandale. In 1411 he was one of the Scottish Commissioners for negotiating a truce with England, but died of a contagious fever, in 1420, at the age of 82. Marjory, who married Sir John Swinton, 15th of that Ilk, killed at the Battle of Verneuil, France, in 1424. [S746] Wikipedia, online http://Wikipedia.com, http://en.wikipedia.org/wiki/George_I,_Earl_of_March. Biography*: He succeeded to the title of 9th Earl of Dunbar [S., c. 1115] on 25 July 1368. He succeeded to the title of 3rd Earl of March [S., c. 1290] on 25 July 1368. Between 1370 and 1390 referred to in contemporary sources by as Lord of Annandale and the Isle of Man. He held the office of Warden of the Marches in 1372. He fought in the Battle of Otterburn in 1388, where he took command of the Scots after the death of ‘Black Douglas.' In 1400 he renounced his allegiance to King Robert III on that King's eldest son and heir the Duke of Rothesay breaking off his engagement to the 9th Earl's daughter, Elizabeth. He fought in the Battle of Homildon Hill in 1402, with the English. He fought in the Battle of Shrewsbury in 1403, with the English against Harry Hotspur, now in rebellion. In 1406 after King Robert III's death, he negotiated with the Regent a renewal of allegiance to the Scottish Crown, though at the price of the Lordship of Annandale among other possessions. George Dunbar, 9th Earl of Dunbar was born circa 1336. He was the son of Sir Patrick Dunbar and Isabel Randolph. He married Christian de Seton, daughter of Alan de Wyntoun and Margaret de Seton. He died between 1416 and 1420. George Dunbar, 9th Earl of Dunbar succeeded to the title of 3rd Earl of March [S., c. 1290] on 25 July 1368. He succeeded to the title of 9th Earl of Dunbar [S., c. 1115] on 25 July 1368. Between 1370 and 1390 referred to in contemporary sources by as Lord of Annandale and the Isle of Man. He held the office of Warden of the Marches in 1372. He fought in the Battle of Otterburn in 1388, where he took command of the Scots after the death of ‘Black Douglas.' In 1400 he renounced his allegiance to King Robert III on that King's eldest son and heir the Duke of Rothesay breaking off his engagement to the 9th Earl's daughter Elizabeth. He fought in the Battle of Homildon Hill in 1402, with the English. He fought in the Battle of Shrewsbury in 1403, with the English against Harry Hotspur, now in rebellion. In 1406 after King Robert III's death, he negotiated with the Regent a renewal of allegiance to the Scottish Crown, though at the price of the Lordship of Annandale among other possessions. Biography*: Patrick de Dunbar, 9th Earl of March (c. 1285–1369) was a prominent Scottish magnate during the reigns of Robert the Bruce and David II. The earldom, located in East Lothian, and known interchangeably by the names Dunbar and March (so-called Northumbrian or Scottish March), was one of the successor fiefs of Northumbria, an Anglo-Saxon Kingdom and later Earldom. The Dunbar family descended from one branch of ancient Earls of Northumbria, specifically from a branch which also had Scottish royal blood. He is said to have been aged 24 in 1309 at the death of his father, Patrick, 8th Earl of March, who had been one of the Competitors for the Crown of Scotland in 1291. His wife, Marjory, daughter of Alexander Comyn, Earl of Buchan was also descended from King Donald III. After the Battle of Bannockburn, Patrick de Dunbar gave sanctuary and quarter to the English King Edward II at the fortress of Dunbar Castle, on the east coast of Scotland between Edinburgh and Berwick-upon-Tweed, and managed to effect the king's escape by means of a fishing boat whereby that monarch was transported back to England. The earl afterwards made his peace with his cousin Robert the Bruce, and was present at the parliament held at Ayr on 26 April 1315, when the succession to the Crown of Scotland was settled. In 1318 he assisted in retaking Berwick-upon-Tweed from the English, at which time he is noted as Sheriff of Lothian. In 1320 he was one of those nobles who signed the Letter to the Pope asserting the independence of Scotland. Laing relates a charter of a Precept originally written in Norman-French by Patrick de Dunbar, Earl of March, to Sir Robert Lauder of Quarrelwood, for heritable sasine of the reversion of the lands of Whitelaw within the Earldom of Dunbar, plus 10 livres yearly from the mill of Dunbar, and the farms and issues of the granter's said town ('ville') of Dunbar, according to the terms of charters to the grantee. Dated at Berwick-upon-Tweed, 20 October 1324. Sometime after 1331 the Bishop of Durham complained to the Regency in Scotland that the village of Upsettlington, on the Scottish side of the River Tweed west of Norham, belonged to the See of Durham and not the Earl of Dunbar, who had seized it. The King of England now became involved also and it appears the lands were restored to the Bishop. In 1332 the Earl of Dunbar was appointed by the assembly of the estates (Parliament) at Perth, joint Guardian of the Crown, upon the death of the Regent, Thomas Randolph, 1st Earl of Moray. He opposed Edward Balliol in several battles and skirmishes following the Battle of Dupplin Moor. Following the Battle of Halidon Hill in 1333, the Earl of Dunbar and several others of the nobility paid fealty to King Edward. The Earl attended Edward Balliol at the parliament held at Edinburgh in February 1334 when they ceded to England Berwick, Dunbar, Roxburgh, and Edinburgh, as well as all the southern counties of Scotland. Earl Patrick had had his castle levelled to the ground, but Edward III of England now compelled him to rebuild the fortress at his own expense and garrisoned it with English troops. Dunbar castle was not restored to the Earl until 1338. In 1335 when King Edward III and Baliol had made another attack upon the Scots, the Earl cut off a body of archers on their return southward, and afterwards assisted John Randolph, 3rd Earl of Moray in defeating the Count of Namur at the Battle of Boroughmuir close to Edinburgh. In 1339 the Earl of Dunbar assisted the High Steward of Scotland, in the reduction of Perth, where he led the second division of the army. In 1340 he and the Earl of Sutherland were routed by Sir Thomas Grey and Sir Robert Manners, assisted by John Copeland and the English garrison of Roxburgh Castle, during border skirmishes. Patrick, Earl of Dunbar, had a Safe-Conduct dated 24 March 1342, from Westminster, in order to travel to England. Patrick, Earl of Dunbar, commanded the right of the Scottish army in the Battle of Neville's Cross, near Durham. From this disaster the Earl escaped, with considerable losses, which included his wife's brother, John Randolph, 3rd Earl of Moray. In 1355 with William, Lord of Douglas and Sir William Ramsay of Dalhousie, the Earl of Dunbar again invaded Northumberland, and subsequently recovered Berwick-upon-Tweed, although not the castle. In 1357 he was one of the Scottish ambassadors who met at Berwick to discuss the liberation of King David, who had been taken prisoner at Neville's Cross. He was subsequently one of the hostages for David until the ransom was paid, although it would appear from Safe-Conducts that he was out and about thereafter. Following this his town of Dunbar was erected into a Royal Burgh. In 1366 he made a pilgrimage to the shrine of St. Thomas Becket at Canterbury. In May 1367 he confirmed to the monks of Coldingham Priory by charter to the Prior and Convent of Durham, the church and manor of Edrom, and Nisbet, with the agreement of his wife. In June 1368 the King was advised by parliament at Scone to consult with the Earls of Dunbar and Douglas on the security of the Eastern marches. He was not present at the Coronation of King Robert II in 1371 so it is assumed that he died before then. Brown gives a year of death as 1368. If that is so it would probably be 1368/9. [S746] Wikipedia, online http://Wikipedia.com, https://en.wikipedia.org/wiki/Patrick_V,_Earl_of_March. Biography*: Agnes, Countess of Dunbar and March (née Randolph; c. 1312–1369), known as Black Agnes for her dark hair and eyes, and sallow complexion, was the wife of Patrick, 9th Earl of Dunbar and March. She is buried in the vault near Mordington House. She was the daughter of Thomas Randolph, Earl of Moray, nephew and companion-in-arms of Robert the Bruce, and Moray's wife, Isabel Stewart, herself a daughter of John Stewart of Bonkyll. Agnes became renowned for her heroic defence of Dunbar Castle in East Lothian against an English siege led by William Montagu, 1st Earl of Salisbury, which began on 13 January 1338 and ended on 10 June the same year. Women were known to take charge of castle or manor business while the husband was away in the Middle Ages, but the stand of Lady Agnes is one of the best remembered instances. Salisbury’s first attempt at taking the castle centered on catapulting huge rocks and lead shot against the ramparts, but this was met with disdain by Lady Agnes, who had one of her ladies-in-waiting dust off the ramparts with her kerchief. The English were employing an enormous siege tower called a sow in an attempt to storm the castle, but the countess simply advised Salisbury that he should “take good care of his sow, for she would soon cast her pigs, meaning his men, within the fortress.” She then ordered that a boulder, which had been heaved on them earlier, be thrown down from the battlements and crushed Salisbury’s sow to pieces. Unable to make progress through arms, Salisbury turned to craft. He bribed the Scotsman who guarded the principal entrance, advising him to leave the gate unlocked or to leave it in such a manner that the English could easily break in. However, the Scotsman, though he took the Englishman’s money, reported the stratagem to Agnes, so she was ready for the English when they made entry. Though Salisbury was in the lead, one of his men pushed past him just at the moment when Agnes’s men lowered the portcullis, separating him from the others. Agnes, of course, had meant to trap Salisbury, but she moved from stratagem to taunt, hollering at the earl, " Farewell, Montague, I intended that you should have supped with us, and assist us in defending the Castle against the English." At one point, having captured Agnes’s brother, John Randolph, 3rd Earl of Moray, the English threw a rope around his neck and threatened to hang him if Agnes did not surrender the castle. However, she merely responded that his death would only benefit her, as she would inherit his earldom. She was not actually in line for the earldom, so either she was taking a serious gamble with her brother’s life or the story is a later embellishment. As his last resort, Salisbury decided to isolate the castle from the roads and any communication with the outside world in an effort to starve the Countess and her garrison, but Ramsay of Dalhousie, who had earned a reputation for being a constant thorn in the English king’s side, got wind of what the English were trying and moved from Edinburgh to the coast with forty men. Appropriating some boats, Ramsay and his company approached the castle by sea and entered the postern next to the sea. Charging out of the castle, the Scotsmen surprised Salisbury’s advance guard and pushed them all the way back to their camp. Some accounts describe her as Countess of Moray, on the assumption that she inherited the earldom when her brother John was killed at the Battle of Neville's Cross in 1346. However, the earldom actually reverted to the crown. However, in 1371/2, Agnes's nephew, John Dunbar, was created Earl of Moray by Robert II, his father-in-law. It seems that there were no surviving children of the marriage between Agnes and the Earl. Their estates were left to children of the marriage between the Earl's cousin John de Dunbar of Derchester and Birkynside and his wife, Isobel Randolph, Agnes's younger sister. [S746] Wikipedia, online http://Wikipedia.com, https://en.wikipedia.org/wiki/Agnes,_Countess_of_Dunbar. Biography*: He gained the title of 1st Earl of Moray. He fought in the Battle of Bannockburn in 1314. He fought in the Battle of Byland in 1322. He held the office of Regent of Scotland between 1329 and 1332. 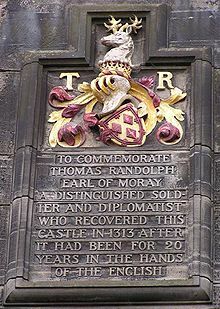 Thomas Randolph, 1st Earl of Moray (died 20 July 1332) was Regent of Scotland, an important figure in the Wars of Scottish Independence, and is named second of those in whose names the Barons' Letter to Pope John XXII, commonly known as the Declaration of Arbroath, was sent. He is usually described as a nephew of Robert the Bruce although their exact relationship is uncertain. The traditional view is that it was through a daughter of the first marriage of Countess Marjorie of Carrick, who was mother of King Robert by her second marriage. However modern sources state that the King's father Robert (1253–1304) married secondly, after 1292, to a lady with the Christian name of Eleanor (died 1331) by whom he had a daughter, Isabel de Bruce, who married Thomas Randolph, Lord Chamberlain of Scotland. 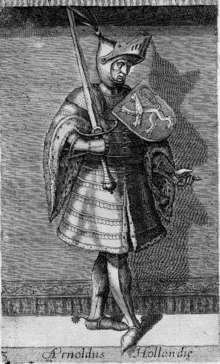 Thomas, the future Earl of Moray, supported Bruce in his initial coup when he proclaimed himself king and was crowned at Scone, but was captured after the defeat at the Battle of Methven and changed sides. Later, fighting for the English, he was in the company of Bruces Scottish enemy John MacDougall of Lorn but was captured and brought before the king, whom he taunted for his alleged cowardice by engaging in guerrilla warfare instead of standing and fighting in pitched battle. He was then put into solitary confinement where he would have plenty of time to think about his decisions. However, he was persuaded to change sides again, and went on to become one of the king's most important lieutenants. The fact that he was allowed to resume his allegiance to Bruce suggests that they did have family ties. His most famous achievement took place on 14 March 1314 when he carried out a daring attack on Edinburgh Castle. This was one of a handful of castles in Scotland still in English hands, and stood on top of an apparently impregnable rock. Amongst his men was William Francis, the son of a former Governor, who knew about a path up the rock, which he had used to visit the town at night against his father's wishes. He volunteered to show Randolph the route and at the dead of night, Randolph led his men up this path to capture the castle. He played an important role in the Scottish victory at Bannockburn, where he commanded one of the divisions (schiltroms) of the infantry, the others being commanded by King Robert and Edward Bruce, the king's brother. It is difficult to say exactly when Randolph was raised to the Earldom of Moray, but by 1315 he is styled "Thomas Ranulphi comes Morauie". He accompanied the king's brother, Edward Bruce, on his invasion of Ireland in 1315 and was one of the principal leaders of the war against the English settlers in Ireland. He was also in charge of returning to Scotland to gather reinforcements and to transfer soldiers between the two fronts as needed. After the death of Edward Bruce and the recall of the expeditionary force from Ireland, Sir Thomas was sent by his uncle as envoy to the court of Rome where he succeeded in getting a temporary absolution for King Robert who had been excommunicated for killing John Comyn. In 1326 he also led the Scottish deputation which negotiated the Treaty of Corbeil, renewing the defensive Franco-Scottish alliance. On the death of Robert I, the crown was inherited by his son David II, who was only five years old. Randolph became Regent, but three years later died of a sudden illness at Musselburgh on his way to repel an invasion by Edward Balliol and his supporters. At the time it was said that he had been poisoned by the English, but this is now discounted by many scholars though many Scots still believe he was murdered. His successor as Guardian was Domhnall II, Earl of Mar. Agnes Randolph, who married Patrick Dunbar, 9th Earl of Dunbar. [S746] Wikipedia, online http://Wikipedia.com, http://en.wikipedia.org/wiki/Thomas_Randolph,_1st_Earl_of_Moray. Biography*: Menteith was the son of Alexander, Earl of Menteith, and is first on record as a hostage in England, to ensure the good behaviour of his father in 1296. He and his brother Peter Menteith, accompanied the English King as esquires, on his expedition to Flanders in 1297. He supported King Robert the Bruce in his initial attempt to seize power following the deposition of John Balliol. Menteith was declared forfeit by Edward I of England, and his lands and title given to John Hastings, 1st Baron Hastings . He was captured at the Battle of Methven, and given to Hastings' disposal. Menteith was committed to Abergavenny Castle where he died a prisoner before 1310. Biography*: Umberto II, surnamed the Fat (1065, Carignano, Piedmont – 14 October 1103), was Count of Savoy from 1080 until his death in 1103. He was the son of Amadeus II of Savoy. Biography: Amadeus II (c.?1050 – 26 January 1080) was the Count of Savoy from 1078 to 1080. His life is obscure and few documents mention him. During his reign he was overshadowed by his mother, but he had good relations with the Papacy and, for a time, the Holy Roman Emperor. The second son of Otto, Count of Savoy, and Adelaide, Margravine of Turin, Amadeus II was probably born around 1050, because he, alongside other noblemen of the Kingdom of Burgundy, swore an oath on the tomb of Saint Peter in Rome to defend the Church around 1070–73. In 1074 Pope Gregory VII was trying to persuade William I, Count of Burgundy, to remember this vow and, with Amadeus and others, go to the defence of the Roman Empire in the East against the Seljuk Turks. As his mother is known to have had good relations with the Papacy in these years, this record seems to indicate that Amadeus was following his mother's policies at this early stage in his career. Early in 1077 Amadeus, with his mother and brother Peter, then Count of Savoy, hosted his sister Bertha, and his brother-in-law, Bertha's husband, the Emperor Henry IV. Amadeus and Adelaide then escorted the imperial couple to Canossa so the excommunicated emperor could reconcile with the pope. There they both took part in the negotiations and stood as pledges for the emperor's good faith. On 16 July 1078 Amadeus and Peter witnessed a donation of their mother's to the Abbey of Novalesa. It was the last act of Amadeus and Peter together. On 9 August 1078 Peter died and Amadeus succeeded him as Count of Savoy, but in the March of Turin, where Peter had co-ruled with their mother, Amadeus was never margrave, although the reason for this is unclear. One document, issued by his widowed daughter Adelaide in 1090, refers to him as "count and margrave" (comes et marchio), but it is probably anachronistic. There is only one document from his reign, in the cartulary of Saint-André-le-Bas in Vienne, which is dated when "Count Amadeus [was] reigning." This shows, by the absence of the regnal year of the emperor, that despite his involvement in the reconciliation at Canossa, Amadeus II was neutral in the wider Investiture Controversy and the wars against Henry IV that it caused in Germany. [S746] Wikipedia, online http://Wikipedia.com, http://en.wikipedia.org/wiki/Amadeus_II,_Count_of_Savoy. Biography*: Dirk III (also called Diederik or Theodoric) was Count of Holland from 993 to May 27, 1039, until 1005 under regency of his mother. It is thought that Dirk III went on pilgrimage to the Holy Land around 1030, hence his nickname of Hierosolymita. The area over which Dirk ruled was called Holland for the first time only in 1101 and was usually known as West Friesland at this time. The actual title of Count Dirk III was Count in Friesland. Western Frisia was very different from the area (North and South Holland) of today. Most of the territory was boggy and subject to constant flooding and because of this very sparsely populated. The main areas of habitation were in the dunes at the coast and on heightened areas near the rivers. Count Dirk was a member of the house of Holland, an important family within Germany at that time. His mother, Luitgard of Luxemburg, was regent in the county while Dirk was still a minor, from 993-1005. She was the sister-in-law of Emperor Henry II and with his help she managed to maintain the county for her son. After Dirk assumed the government of the county, she still used her family connections to acquire imperial assistance, in one instance an imperial army helped Dirk suppress a Frisian revolt.Conflict with the emperor. Prior to 1018, Count Dirk III was a vassal of Henry II, but the bishops of Trier, Utrecht and Cologne all contested the ownership of Dirk's fiefdom, which was in a strategically important location. Utrecht, situated in the Rhine delta, was the largest trading town of the German kings in the area and traders had to sail through the territories of Dirk III, by way of the Rhine and Vecht rivers, in order to reach the North Sea. Also, the German kings and emperors were frequently resident in Utrecht and the nearby estate of Nijmegen. Another trade route that ran through Dirk's territory was from the city of Tiel to England. It was along this second route that Count Dirk built a stronghold at Vlaardingen, in a newly habitable area where many Frisians had recently settled by his invitation. He was not permitted to levy tolls or hinder trade in any way, but eventually he defied imperial rule. Working together with the Frisians now living in the area he stopped passing ships, demanding payment of tolls. Merchants from the town of Tiel sent alarmed messages to the king and Bishop Adelbold of Utrecht about acts of violence against them by Dirk's men. Emperor Henry then decided to end Dirk III's reign and awarded his lands to Bishop Adelbold. A large imperial army, made up of troops supplied by the various bishops of region, under the command of Godfrey II, Duke of Lower Lorraine, then headed for the stronghold at Vlaardingen. The ensuing Battle of Vlaardingen was a disaster for the imperial army and a tremendous victory for Count Dirk; many of the imperial commanders perished and Duke Godfrey was captured. Following this victory, Dirk III was permitted to keep his lands and he continued levying tolls. Later on, Dirk also managed to acquire more lands east of his previous domains at the expense of the Bishop of Utrecht. After the death of Emperor Henry II in 1024, Dirk supported Conrad II for the succession to the kingship. After Count Dirk III's death in 1039, imperial armies were sent on a few more occasions seeking to reclaim the lands held by the Frisian counts. 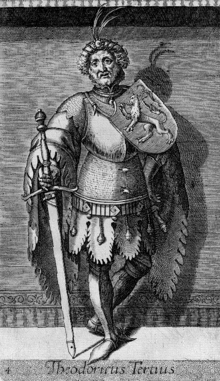 The powerful Robert I, Count of Flanders (called Robert the Frisian) helped Dirk V, grandson of Dirk III and his own stepson, to restore Frisia to the counts. [S746] Wikipedia, online http://Wikipedia.com, http://en.wikipedia.org/wiki/Dirk_III,_Count_of_Holland. Biography: Arnulf, also known as Aernout or Arnold succeeded his father in 988 as Count in Frisia. He was born in 951 in Ghent and because of this he is also known as Arnulf of Ghent. Arnulf was the son of Dirk II, Count of Holland and Hildegard, thought to be a daughter of Arnulf of Flanders. Arnulf is first mentioned (together with his parents) in 970. Like his father, his name appears in numerous Flemish documents at the time. In 983 Arnulf accompanied Emperor Otto II and future Emperor Otto III on their journey to Verona and Rome. As count he managed to expand his territories southwards. Arnulf donated several properties to Egmond Abbey, amongst others Hillegersberg (which was previously called Bergan, but renamed after Arnulf's mother) and Overschie, which may have been rewards for the land-clearing activities of the monks of Egmond. 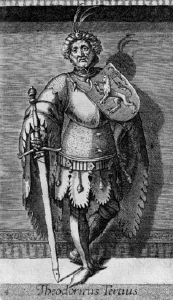 Arnulf was the first count to come into conflict with the West-Frisians and in 993 he invaded their territory, but on 18 September of that year he was defeated and killed in a battle near Winkel in West-Friesland. His son Dirk was still a boy at this time, but Arnulf's widow Luitgard managed to retain the county for her son with support from first Emperor Otto III and later her brother-in-law, Emperor Henry II. In May 980 Arnulf married Lutgard of Luxemburg, a daughter of Siegfried, Count of Luxemburg. The couple had (at least) two sons; the future Count Dirk III and Siegfried (also known as Sicco). Arnulf, his wife and his sons were all buried at Egmond. He also had a daughter, Adelina of Holland, who was married to Baldwin II, Count of Boulogne and Enguerrand I, Count of Ponthieu. Biography*: Dirk II (920/930 – 6 May 988) was Count of Frisia (west of the Vlie) and Holland. He was the son of Count Dirk I and Geva (or Gerberge). In 983 Emperor Otto III confirmed his rights to properties and territories in the counties of Maasland, Kinhem (Kennemerland) and Texla (Texel), thus stretching along the entire Hollandic coast (as well as inland). Count Dirk II built a fortress near Vlaardingen, which later was the site of a battle between his grandson Dirk III and an Imperial army under Godfrey II, Duke of Lower Lorraine. He rebuilt Egmond Abbey and its wooden church in stone to house the relics of Saint Adalbert, the project starting in 950. Adalbert was not well known at that time, but he was said to have preached Christianity in the immediate surroundings two centuries earlier. The abbey was given to a community of Benedictine monks from Ghent, who replaced the nuns originally at Egmond, probably in the 970s. His daughter Erlint or Erlinde, who was abbess at the time, was made abbess of the newly-founded Bennebroek Abbey instead. Dirk married Hildegarde (thought to be a daughter of Count Arnulf of Flanders, based on the names of her children), and had three known children. His son Arnulf became Count of Holland and Frisia after Dirk's death. The younger son Egbert became Archbishop of Trier in 977. His daughter Erlinde was abbess of Egmont, until that institution was changed by her father from a nunnery into a monastery, after which she became abbess of Bennebroek. [S746] Wikipedia, online http://Wikipedia.com, http://en.wikipedia.org/wiki/Dirk_II,_Count_of_Holland. As the sister-in-law of Emperor Henry II, she enjoyed considerable influence. With his help she managed to maintain the county for her son Dirk III, acting as regent. On 20 September 993, Liutgard donated her properties at Rugge to Saint Peter's abbey of Ghent for the soul of her husband. According to Thietmar's Chronicle, possibly in June 1005, she made peace with the West-Frisians through mediation by Emperor Henry. Biography*: Dirk I (Theoderic) was Count of Holland, thought to have been in office from ca. 896 to ca. 928 or 939. The actual title of count Dirk I was 'count in Friesland'. Dirk is thought to be a son of Gerulf II, 'count in Frisia', who is named by some sources as one of the counts who assassinated their Viking overlord Godfryth 'the Sea King' at a place named Herespich (modern Spijk[disambiguation needed]) in 885. Regarding Dirk I, almost nothing is known of his life, a situation further clouded by the present-day hypothesis that he had a son, Dirk (numbered Dirk I bis, to avoid confusion with the already established numbering), who succeeded him instead of the traditional view that he was succeeded by his supposed son Dirk II. In 922 Dirk was present at a place called Bladella (present day Bladel, in the extreme south of the Dutch province of Noord Brabant), at which he received certain lands ('at a place called Egmond') from the West Frankish king Charles the Simple. Dirk subsequently erected a nunnery at the said lands, at which nuns prayed continuously for the well-being of the comital dynasty. This was the origin of the later Egmond Abbey. [S746] Wikipedia, online http://Wikipedia.com, http://en.wikipedia.org/wiki/Dirk_I,_Count_of_Holland. Biography*: Gerolf or Gerulf (c. 850 – 895/896) was the second count of this name who is attested in the area of Friesland (which also included Holland at the time). Gerolf's main area of power seems to have been in Kennemerland. Count Gerolf is often regarded as the founder of the County of Holland, although the actual name "Holland" is from a later time. His ancestry is unclear, but he may have been a son or, more likely, a grandson of the earlier Gerolf, who was a count in the area of Frisia at the time of the reign of Emperor Louis I the Pious (fl. 833) and who later joined a monastery. The earlier Gerolf died in 855. There is some limited and vague evidence that this earlier Gerolf was a son of a certain Theodoric, who in turn supposedly descended from the Frisian king Redbad (d. 719). 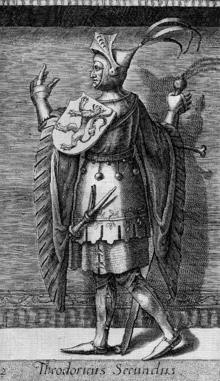 Count Gerolf is often identified as the father of Count Dirk I and seen as the founder of the first house of the Counts of Holland, which ruled the county until it was inherited by John II of Hainaut in 1299. Since the Treaty of Verdun (concluded in 843) Frisia and other parts of the present-day Netherlands had become a part of, at first Middle Francia, then after 855 Lotharingia, and finally after the Treaty of Meerssen it was incorporated into East Francia in 870. However, ever since the 840s a series of Viking leaders had been installed in the region (as a means of defense against further incursions) and they were the de facto rulers of the region. It was not until 885 that this situation was put to an end by the murder of Godfrid, Duke of Frisia at a place called Herespich (identified as modern Spijk). According to some sources Count Gerolf and Eberhard Count of Hamaland (who was later appointed Margrave of Frisia) were foremost amongst the conspirators in this plot. In the Chronicon of Regino of Prüm, on the other hand, there is no mention of Gerulf as taking part of this plan. Instead, according to this version, the murdering scheme would have been instigated by Emperor Charles and a certain Duke Henry. If so, it was, possibly, then, effectuated by Eberhard. 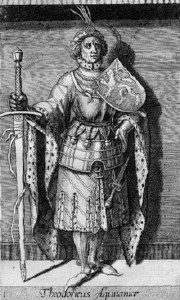 The same Eberhard was hunted out and killed by Gerolf's son Waldger in 898, but the origin of that conflict is unknown, a possible explanation being that Waldger (who probably descended from Frisian royalty, see below) contested Eberhard's recent appointment as Margrave. It might be important remembering, in face of this scenario, how Merovingian and, most particularly, Carolingian leaders had hunted heathen Frisians just before the Frankish society had to deal with the Viking expansion. In this sense, it is interesting, as well, to observe how far the Gerulfingian House of Holland, during the centuries to follow, would pose an obstacle for the full grasp of this region by the Holy Roman Empire. On 4 August 889, Count Gerolf received a reward for his role in the defeat of the Vikings. On this date Arnulf of Carinthia, King of East Francia, granted him a number of lands and properties in full ownership. Firstly, he was granted an area outside his county, in Teisterbant, which consisted of a number of farms and houses in, amongst others, Tiel, Aalburg and Asch. Also he was granted additional property in his own county, consisting of a forest and agricultural lands, situated somewhere between the mouth of the Old Rhine and (presumably) Bennebroek. Only since the late nineteenth century is Gerolf regarded as the founder of the House of Holland. This is based on a poem composed around 1120. It locates the tombs where members of the house were interred. The poem begins with: "The first Dirk, brother of Waldger was a glorious man ..." In another work Waldger is named: "Waldgarius Freso, Gerulfi filius", which translates as: "Waldger the Frisian, son of Gerolf". However, it appears unusual that, following the death of Gerolf, the eldest son Waldger received Teisterbant, while the younger brother Dirk inherited the comital title, although the title wasn't necessarily inheritable, but often rather by appointment. Also surprising is that Waldger's eldest son was named Radboud and a possible second son (or other relation) of his was named Hatto. It was customary in those days, that the eldest son received the name of his father's father. It is therefore thought that Gerolf was not the father but the foster-father of Waldger and Dirk. Filius in this case meaning foster-son. The most likely candidate for the biological father of Dirk and Waldger is Radboud, prince of the Frisians. (Note: this link is incorrect as it links to King Redbad who ruled about 760) Waldger's nickname Freso may also be indicative of this origin. This prince Radboud fell in battle in 874, while repelling a Viking incursion together with Reginar "Longneck" (Count of Maasgau, later Duke of Lorraine). At this time Dirk and Waldger were still infants. It is further speculated that because Gerolf's sister may have been Dirk and Waldger's mother, her brother acted as her children's guardian after their father had been killed. While Dirk and Waldger were still minors, Gerolf, as guardian, presumably was then appointed count of the threatened area to protect it from the Vikings. Later on, after Gerolf had died without leaving any sons of his own, Dirk then inherited the fief or was appointed as its next count. Possibly Waldger may have received (the properties in) Teisterbant because this was an allodium of the family, the comital title and territories being an imperial appointment. [S882] 1921 Canada Census, Cameron # 8576.